While Christmas is meant to be merry and bright, the holiday period can be quite hectic when it comes to bringing everyone together and organising presents, food and drink – all while sticking to budget! With a wide range of apps available to bring organisation to your life on your phone or tablet, there’s bound to be a whole heap out there that can ease the stress and help keep the Christmas period merry and bright so you don’t find yourself thinking “oh deer!”. 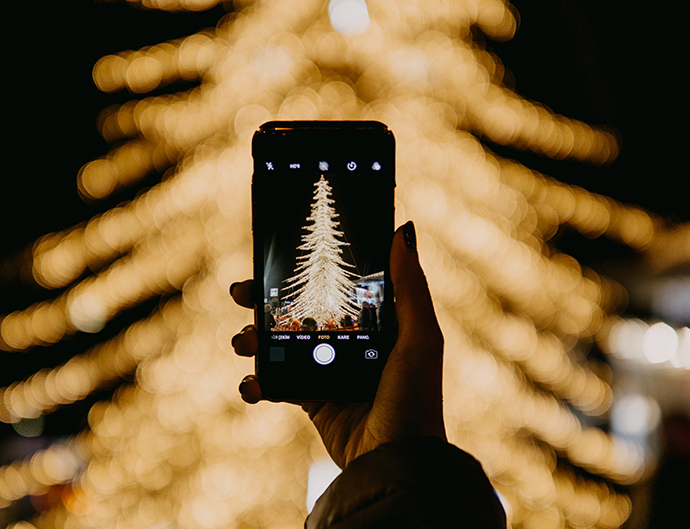 We’ve sourced 10 apps that will help you stay organised and enjoy a stress-free, organised and joyous Christmas – check them out below! Available on: iOS and Android. With over 100 Christmas stations, no matter what your taste in music, you’ll have endless tunes to indulge in over the holidays with the Christmas Radio app! If you’re using the iPad app, you can even add a touch of beautiful festive imagery to the room with the display. There’s even a North Pole radio station that broadcasts right from The North Pole. Wait until the kids hear about this one! Available on: iOSiOS and Android. Cost: The app’s free but it will cost you to send your cards via snail mail. Nowadays, you’ll probably find that your whole family is online in one way or another. If you don’t have time to handwrite your Christmas cards, you can make it quick, easy and lots of fun with Moonpig! You can upload a photo of the kids, the family, the dog or keep it generic. Then add a fun, festive message and send on to your loved ones. iOS users can even upload a handwritten message for an extra personal card. Cards can be sent via email, text, Facebook, Instagram or snail mail. If you opt for snail mail, place your order by 7pm Mon-Fri and your card will be in the post the same day! iOS users you can also opt to send postcards for $1.99 within Australia and $2.99 globally, using the Australia Post Postcards app. Secret Santa (also known as Kris Kringle) is a great way to take the stress out of having to buy a gift for everyone. If you’re organising a Secret Santa for your friends or family, Elfster will be a handy tool to keep in mind and ensure you never draw yourself or your partner. Simply add everyone’s names into the app (or the website if you prefer) and it will assign each person someone to select a gift for. You can also add a wish list so that your Secret Santa can check out some ideas on what to get you. Cost: $2.99 on iOS and Free on Android. Do you have a HUGE list of friends and family to buy presents for and don’t know where to start? This app will allow you to track your Christmas gift list and stay on budget with ease. You can even check out your progress in one view so you know how many days you have left to purchase, wrap and send those gifts. For iOS users, another app option is Santa’s Bag which you can find in the Apple Store for free. Either way, each one of these apps will make sure you don’t forget anyone or anything! Do you have an Elf on the Shelf and decided this is the year you’re going to be super-dooper original but don’t know where to start? Never fear! Let this app do the thinking for you. It’s got endless ideas for creative places to place your Elf throughout the month, even detailing what you’ll need for each setting. All that’s left to do is schedule it into your daily calendar so you don’t miss a day! Cost: Free with in-app purchases available. Christmas party planning is easy as with Punchbowl! The Christmas party invitation collection offers a number of invitations to choose from that look like real paper. Whether your event is a casual BBQ or a classy dinner, there’s an invite for every occasion. You can send invites via email or SMS. Simply select your template, personalise your design, add your guests’ email or phone numbers, and send! 7. A Message from Santa! Message from Santa for the kids – tick! All you have to do is tell Santa a few things about your child, and he’ll schedule in a time to phone them himself! Getting Santa Claus on the line with a word of joyous advice may be just what you need if the kids are testing the boundaries this year. Oh, and there are no costs when you call the North Pole! Need to bring a bottle along to a party or searching for the perfect bottle to wrap up as a gift? Vivino has you covered. You can search for recommended wines in your price range or find out a specific wines ratings, qualities and price by taking a photo of the label and uploading it to the app. If you find a wine you love, or hate, you can also post reviews and comments on the products and track your faves. Being time-poor over the holidays and a huge increase in events can lead to being stumped for meals to cook! Enter Yummly. This app will give you a range of recipe ideas to suit your tastes and diet requirements, a digital recipe box so you can save all your faves in one place for easy reference later, smart recipe shopping lists and recipe scheduling so you can be reminded when it’s time to get cooking! Pic Collage is the perfect photo editing app for the festive season. You can edit photos, design free greeting cards, and create collages. You can select a grid layout or design your own, select holiday stickers, background patterns and textures, and draw your own designs on your collages. Do you have an app that is your life saver over the holiday period? Let us know in the comments. Thanks for bringing this to us! We can arrange further contact for you! Due to privacy reasons, we’ll need you to e-mail us from the details on your account. Please do so, citing this post, along with your details, to iionline@iinet.net.au and we can then help with having Sales e-mail you with a quote. I recently asked why Netflix is no longer in the freezone and never received a reply. When I took out my new contract after years of being with iinet, I was advised that it still was. Yet now its not. When was this change made. Same happened to me sometime back. I was told that the free Netflix was included in my old plan but was not included in my new plan when I changed plans. When I told them that I was not advised of this when I changed plans and that I wouldn’t have changed plans if I had been told of this I was allowed to revert back to the old plan. I have since changed plans again with the introduction of NBN an don’t require the free Netflix data anymore as I have plenty for my needs on the new plan. Merry Christmas to all at IINET , happy with the service all year , very helpful when things were tight and had to stretch my bills , ( don’t suppose you could stretch my last bill ? Just kidding , it will be paid , anyway , those of you who get a break over Christmas , like , me , as I’m unemployed , all the best , and stay off the roads , it’s a jungle out there , well , all the best anyway , I think the Billy’s boiling , and Happy New Year folks !